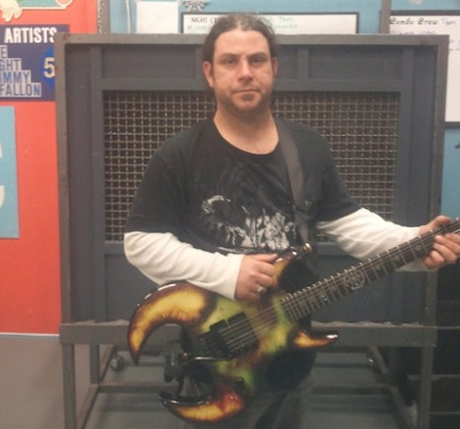 The autopsy report for fallen Gwar guitarist Cory Smoot has just been released. The cause of the six-stringer's death was unknown when his bandmates found him dead in his bunk on their tour bus early last month, but a North Dakota coroner has now delivered the details on his passing, explaining that it was triggered by a pre-existing heart condition. "We have finalized the autopsy report and death certificate. I have determined that Cory died from a coronary artery thrombosis brought about by his pre-existing coronary artery disease," coroner William Masselo wrote in his report. Gwar are currently taking some time off to mourn their fallen bandmate, who performed as heavy metal scumdog Flattus Maximus, but will soon return to the touring circuit, heading out to Europe early next year. They have, however, forever retired the Flattus character. "When Cory died, we all wanted to go home and take care of the family and our own grief. But the best way to do that is by playing all the shows we have planned," singer Dave Brockie (aka Oderus Urungus) recently posted on the group's website. "The response from the U.S. metal community and especially the whole international GWAR family has been overwhelmingly supportive... these GWAR fans need the chance to pay their respects to Cory, and cancelling any shows would deprive them of that." Smoot was the fifth person to play Flattus Maximus and had taken on the role for nearly ten years. Gwar are currently playing as a four-piece and have not announced plans for a new guitarist. Gwar and Metal Blade Records have also set up the Smoot Family Foundation, which was created to help out Smoot's wife Jaime and their unborn son. You can make donations here. A memorial concert featuring performances from Mensrea, Cannabis Corpse and the Dave Brockie Experience will also take place January 7 at the Canal Club in Richmond, VA.